While under contract to the Hartford Wolf Pack, goaltender Miika Wiikman took part in training camp and saw preseason action with the Rangers last September. New York Rangers President and General Manager Glen Sather announced today that the club has agreed to terms with goaltender Miika Wiikman. Wiikman, 23, appeared in 34 games with the Hartford Wolf Pack of the American Hockey League (AHL) this season, posting a 21-8-3 record, along with a 2.30 goals against average, a .919 save percentage and two shutouts. The AHL rookie ranked 10th in the league in goals against average, and he finished tied for sixth overall in save percentage. Wiikman also led the Wolf Pack in wins and tied for the team lead in shutouts. In addition, he appeared in four regular season games with the Charlotte Checkers of the East Coast Hockey League (ECHL), registering a 1-1-2 mark, along with a 2.36 goals against average and a .922 save percentage. The 5-11, 177-pound goaltender has appeared in 75 games with HPK Hameenlinna of the Finnish Elite League (SM-liiga) over three seasons, posting a 38-16-20 record, along with a 2.30 goals against average, a .922 save percentage and five shutouts. In 2005-06, Wiikman established career-highs in games played (34), wins (21), goals against average (2.09), save percentage (.929), and shutouts (three). Additionally, he has appeared in 13 playoff games with HPK Hameenlinna, recording a 9-3 mark with three shutouts, along with a 1.98 goals against average and a .927 save percentage. In 2006, he led Hameenlinna to their only SM-liiga championship in the club’s 62-year history. 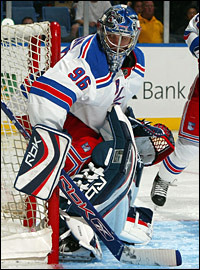 The native of Mariestad, Sweden, signed an AHL contract with the Hartford Wolf Pack prior to the 2007-08 regular season.